I didn’t get a preview card. That’s fine. I’m a small time blog and none of the other small time blogs received a preview card as well. So, no biggie. But a funny thing happened on the way to the Gatecrash Prerelease. I received a phone call from Borborygmos, which is odd because not only does he not like technology, he’s a fictional character. Anyway, he didn’t receive a preview article. I was shocked. Here was one of the guild leaders and he wasn’t previewed like all of the other leagendary leaders. This was a match made in heaven; a blog without a preview card and a preview card without an article. I interviewed Borborygmos for a few minutes. I really don’t want him to crush me. MTG Color Pie: So, Mr. Borborygmos. BORBORYGMOS: No need for formal. Call me Ishmael. ISHMAEL: No. Only joke. Better than saying call me maybe. BORBORYGMOS: See. Gruul more than smash things. Are smart. Know popcorn culture. MTGCP: Alright. Now, I know that you’re a little upset about not receiving a preview article. You want to talk about that? 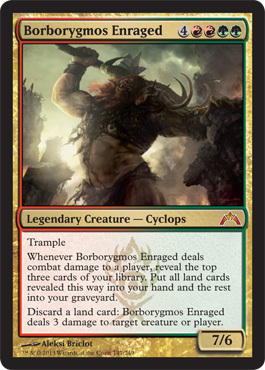 BORBORYGMOS: Unfair since Gruul no have technology. You see guild letter? Hand paint each one. No Steve Guttenberg machine. Have to network social to make popular and be seen. Don’t know how. Both Facebook and Twitter taken by not me. Wish I smash their face. MTGCP: That’s very understandable. I guess that’s why you’re enraged. MTGCP: (Laughs nervously) Wait, how are you talking to me now if you don’t use technology? BORBORYGMOS: Larger iPhone 5 better for fingers. Not that barbaric. Plus, you kill bit. MTGCP: Some feel that you didn’t get an article because you were leaked early. BORBORYGMOS: Always take leak in forest. Don’t see big deal. MTGCP: No, that your card was spoiled way before it was suppose to. BORBORYGMOS: Not Gruul fault. Yet Magic men punish us. We know we no loved. Gruul experience emotion too. Red is core color of Gruul. MTGCP: Well, how do you feel about your new card versus your old one? BORBORYGMOS: Both best cards ever. I make Gruul larger, then throw earth at not-Gruul. How can lose? New art makes tiny man scared faster. MTGCP: And how do you feel about your Charm. It seems a little weak compared to the other ones. BORBORYGMOS: Gruul no weak. Other guilds showoffs. MTGCP: You have any final thoughts? MTGCP: Yes, yes they do. Thanks so much for your time. You need to send this to the wizard guys. This is awesome. Think a Borborygmos/Lost in the Woods deck would work? Keep fogging your opponent when they attack, then when you cast BorBor you draw most of you deck (probably 40 lands in this?) and discard the lands to victory. Fun?